We have listed our favourite adverts from each betting company below and we are big fans of hearing your ideas. Let us know below which adverts you think we could see in 2018 and which one was your favourite! We’ll feature our favourites in the article! Paddy Power’s promotion of their mobile app is definitely one of our favourites. They have created two adverts with one of these being absolutely hilarious! On the first of our list, we have a great advert from possibly the biggest players in the betting advertising industry – Paddy Power. The advert involves a really well edited, digital set of clips and we get to see the phone with the application mirrored on the phone. This is great as we see exactly what the great app looks like. There were fans of the app that were very eager to get the advert for Android and eventually Paddy Power provided! @paddypower saw the advert for the ipad app, when we getting the android one? Paddy Power are definitely up there with our favourite betting companies when it comes to adverts. They never fail to provide humour in their clips and for this, we always love to feature them in our articles. This advert is a great promotional strategy for their app as it lists many different features and why it is better than others! In this advert from Paddy Power, it really is no surprise to see why it was banned! As hilariously funny as it is and as much as we love it, the great humour would definitely be something that you wouldn’t want to appear on the TV when you are sat with your family. Regardless, the advert is so funny that we class it as one of our favourites and think Paddy Power has done a great job in promoting their mobile app with a number of references and a few scenes involving the phone and the app. Ladbrokes are a really strong betting company so the advert to promote their new tablet app was a great addition to their already strong company. Ladbrokes decided to also follow a completely digital advert for their TV feature. They use a similar format to many of the other advertisement companies and always provide their viewers with an exciting, descriptive advert to ensure that they can tempt them to use their app over their competitors. This advert was created for their new tablet app which is very unusual as most of the advertisement companies simply promote their mobile apps in one advert. However, this extra effort that has been put in by Ladbrokes is a great way of providing their viewers with a sense of reliability and a feeling that they care about their products and services which always goes down well when hoping to gain new customers! Betfair’s long advert was really successful on streaming websites such as YouTube as the video gives a really deep insight into the advantages of using their betting advert. This 2-minute advert from Betfair really explains the ins and outs of their new Betfair Mobile Application. By showing the viewers something unique and different from the standard 30-second advert, it is likely to be successful as it shows them everything about the app including features, benefits and more. Sky are known as one of the biggest, if not THE biggest players in the TV market so their adverts are always expected to be super high quality. Their adverts for the mobile app promotion really do live up to expectation and their high standards of quality. This advert is really cool due to the amazing editing that we get to see. We aren’t too sure how Sky Bet have managed to create this advert, to be honest, but it really does amaze us! It involves a real scene of a football player scoring a penalty, then a ‘rewind’ happens and we see the exact same clip again, however, this time the goalkeeper somehow pulls a world-class backflip save out of his pocket! It is an amazing advert because everything in the ad is perfect. The crowd, the sounds, the visuals and everything are all spot on by Sky Bet so that they get the best reaction possible. The Sky Bet Tracker is a great new addition to Sky Sports’ App which involves a complete revamp of how the app works to make it much better and easier for betting users using the app. They promote this new feature really well by emphasizing all of the great advantages that they now provide such as ‘in control’, ‘info’ and ‘in the know’. The advert is really well-edited and has been created to a very high standard which is obviously really essential for such a high-quality brand like Sky Bet. It is really easy for Sky Bet to promote their services due to their amazing dominance in the broadcasting industry and Sky Sports can be used as a great platform to do this. Unibet’s mobile advert is another great example of a really beneficial promotional advert for a great new betting app for their users. The ad successfully promotes Unibet’s application and their brand. Unibet are a great betting company that offers a variety of different gambling services and options. They successfully promote their new mobile app to dedicated viewers through the TV advert and has racked up over 15,000 views on YouTube. The advert contains a number of different editing techniques and like most of the other adverts, we see a great visual representation of what the app looks like on a phone. Unibet are great at creating these adverts due to all of the benefits they promote and the popularity of them as they achieve some great results for their promotion. BetVictor created this video for their new Android app very recently. It is clear to see the differences between this advert and others from past years which are of worse quality and of a lower standard. BetVictor create a really clean, well-edited advert. 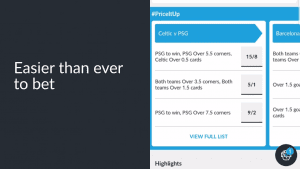 BetVictor decided to follow the road of creating a digital advert to promote their new Android app. A lot of the betting companies created these adverts for android apps which is strange considering IOS is such a large target. Regardless, however, BetVictor still do a great job of promoting their android app. The advert is really attractive and looks great for BetVictor, allowing them to promote their brand through a really high-quality advert. They also explain why their app is so good to tempt viewers into choosing their company to bet with. Betway’s adverts are rarely ever worthy of criticism and this advert continues that. By using real-life scenes in their promotional advert, the audience stays hooked and is fascinated by the whole advert. Betway’s application advert is great because of all of the real-life footage it features. Out of all the mobile application adverts, this one definitely involves the most real footage and for that reason, we rank it very highly on our list. It isn’t the funniest advert but nonetheless, it is still a really great advert for promoting the Betway mobile app. We see many different scenes involving a phone with the Betway app and emphasis is placed on the ‘free bet for £30’ which tempts viewers in even more. This is great for providing the audience with a reason to get on the app. Coral is known for their adverts feating Farley and Carly due to the hilarious comedy they provide to the ads. It is always a great refreshment seeing these two during the break of a sports event which is why Coral have been so successful and want to make more ads with them both. This advert is probably our favourite of the series because of the pure quality of the entire advert. It has real scenes, great comedy and entertainment. The setting is in a relatable area for football fans who are likely to be a huge part of the audience for the advert and that is why it is so successful. The humour of Farley is key to the success of this advert and the comedy involved through the over-exaggerated list of all of the food and the odds is really relatable and funny for the audience. They also really promote the application on the television so it is completely in the viewers face. Virgin Games use a great promotional method of creating their adverts in a series. This is really useful to the company because the audience gets to know the characters, allowing Virgin to save time with introductions and get straight into the advert. The main promotion of the mobile application for Virgin Games in this advert comes towards the end where Vlad the Vampire explains he has learnt to ‘live a little’. We see him on his phone playing Virgin Games application and the advert ends with a really funny scene of him sunbathing in bad weather saying ‘I got a tan’. This advert is really funny and provides a range of promotion for many different aspects of Virgin Games including their brand, their application and even their advertisement series. By creating 4 of these adverts featuring Vlad the Vampire, they are able to build a connection with the audience and viewers. 888Sport have a number of virtual, digitally edited adverts that are all really beneficial and do a great job of providing promotion for their features in cool transitions and clips. The slogan of ‘App Tap Bet’ in this advert is amazing. By promoting their £88 offer alongside this, 888Sport are being really smart to get viewers on their app. The advert isn’t created to be funny but is more to be a really beneficial method of achieving more awareness for their new application. We believe it does a really successful job in creating this awareness and the advert itself looks stunning. There are a range of edits and transitions to make the advert flow as one and a range of great images to match the text. In their promotional mobile betting advert, William Hill follows the same format as 888Sport with a completely digital advert focusing on all of the advantages of their mobile app. William Hill use a great soundtrack for this advert that is really popular with football fans due to its common appearances on Sky Sports and Fifa. Although this doesn’t seem like much it gives an immediately relatable aspect to the audience and will likely make them watch the advert. The advert is a very great clip that involves a number of editing techniques and promotion for the app. By including some tasty facts and figures such as ‘200 ways to bet’ William Hill are able to attract viewers into choosing their app to play on.